Our Delos Tour from Mykonos visits the island that is believed to be the birthplace of Apollo and was one of the most sacred places of ancient Greece. 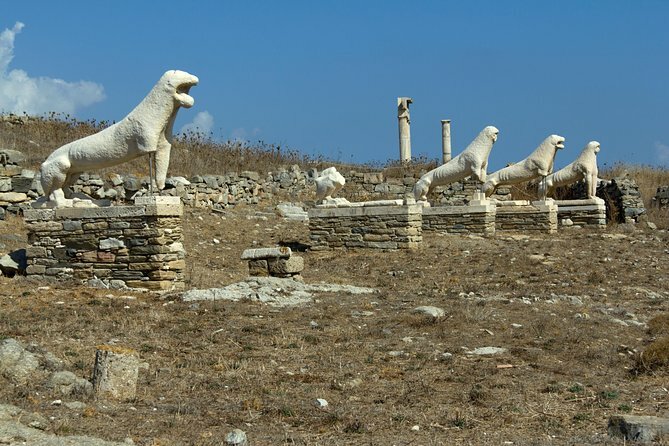 Our Delos Tour from Mykonos visits the island that is believed to be the birthplace of Apollo and was one of the most sacred places of ancient Greece. The island undoubtedly owed its success to its superb location at the very center of the Aegean, allowing seafarers to meet it in the middle of their journey as they sailed from the major commercial centers. Only a 45 minute boat ride away from Mykonos Delos was the centre of the Cyclades of the ancient world, the island of light, birthplace of Apollon and Artemis, home to the first multicultural civilization and having been inhabited between 2500 and 69 b.C. Delos boasts of many treasures remaining from these times like the ancient market place Agora, the famous terrace of the Naxos lions, the holy lake, the ancients living quarters and theatre that give you a lively vision of the daily life then; especially the houses of Dionysos, Kleopatra, the Trident, the Masks, the Dolphins with their mosaics are a fantastic experience of art not to be missed.